The daily limit is 4 trout, with a minimum size restriction of 15 inches to keep brown trout. No bait restrictions. A daily fishing tag is required. Catch-and-release fly fishing is permitted from 8:00 am to 4:00 pm seven days a week. Maramec Spring Park is a privately owned park just south of St. James, and it is truly a beautiful location. The park itself is owned and managed by the James Foundation, and the park pays its bills by charging a parking fee and selling various novelty items, like Maramec Spring Park T-shirts and ball caps. The trout fishing part of the park is managed by the Missouri Department of Conservation, so you'll also have to pay a daily fee to fish. And, as it is the closest trout park to the St. Louis area, expect to fight the crowds for space on the bank. The Spring is stunning, and the river is lovely, but it has its detractors. Large portions of the stream bank are paved, channelizing the spring branch. While this provides easy access for fisherman, it eliminates much of the character that the stream probably once had. There are precious few riffles, but plenty of deep pools, which tends to cater more to lure and bait fishermen rather than fly fishermen. In fact, the waters which are most attractive to fly fishermen are in the "fish sanctuary", which, of course, means no fishing is permitted. We are hoping for the day when the James Foundation and/or the Missouri Department of Conservation decide to change the trout sanctuary to a catch-and-release fly fishing area, a la Montauk State Park. Come on guys, please! Check out Montauk -- the trout in the catch-and- release areas are doing just fine! 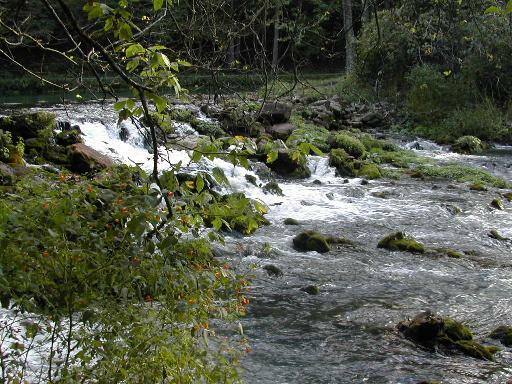 Like all of the trout parks, Maramec Spring is stocked nightly in preparation for the next day's fishing. The fishing day is announced by a siren that sounds in the park, and most every fisherman will catch a few at that time. After all, these hatchery fish were hand-fed just yesterday. After 1/2 an hour or so, however, the fishing becomes more difficult and trout don't seem to follow any consistent rules. The most successful method for catching trout park fish is usually sight fishing -- cast your bait, lure or fly directly to a specific fish and try to drift it right to his nose. Trout are naturally lazy and will often eat something rather than move out of the way. ​Regardless of your opinion of the fishing, the park is a wonderful place to visit. There is a nice museum on the grounds, a driving tour of the old iron mine, a few playgrounds, a great field for kite-flying, and numerous pavilions and barbecues. ​Maramec Spring Park is located south of St. James on Hwy 8.